Over the weekend, we showed you /the-martian-movie-photo-matt-damon/The first photo of Matt Damon in director Ridley Scott's The Martian. Now, we have nine more images from the movie, which give us a first look at Matt Damon's co-star, the earth-bound Kristen Wiig. We also get to see more of Matt Damon as a stranded astronaut on Mars, as well as a look at the action behind-the-scenes on what will surely be one of the more exciting movies this coming holiday season. 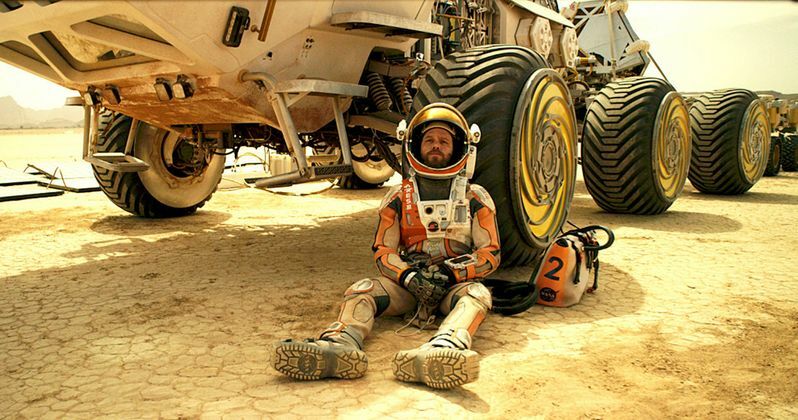 During a manned mission to Mars, Astronaut Mark Watney (Matt Damon) is presumed dead after a fierce storm and left behind by his crew. But Watney has survived and finds himself stranded and alone on the hostile planet. With only meager supplies, he must draw upon his ingenuity, wit and spirit to subsist and find a way to signal to Earth that he is alive. Millions of miles away, NASA and a team of international scientists work tirelessly to bring "the Martian" home, while his crewmates concurrently plot a daring, if not impossible, rescue mission. As these stories of incredible bravery unfold, the world comes together to root for Watney's safe return. "I got to see all the maps of Mars, and participate in an 3D virtual reality perspective. It was incredible, as soon as I put the glasses on, I felt like I was really there on Mars. Whether I looked left or right, it felt like I was there with actual images all around me. It was a fantastic way to imagine what it would be like to be on that planet."